It's "A Mickey Celebration," with lots of spots for snapshots, in Downtown Disney District. There's a lot of "pop" woven through Disneyland Resort, from the popcorn you munch while strolling along Main Street to the pop-style songs that play during the parades to the Funko POP! figurines of your favorite characters. 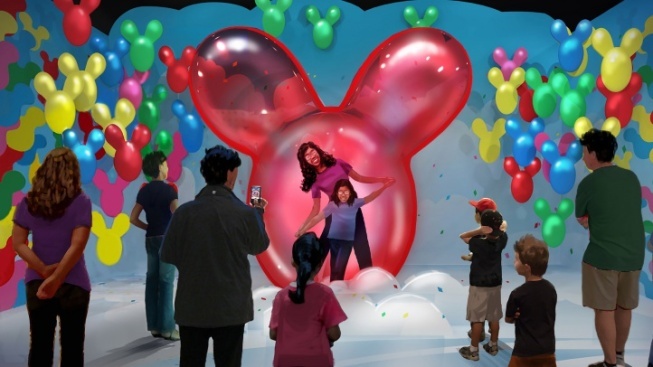 But a fresh take on the pop-fun concept is arriving in Anaheim in late April, with a "limited-time pop-up experience" in the Downtown Disney District. It's Pop-Up Disney! A Mickey Celebration, a snapshot-ready series of whimsical spaces made for strolling through, and, yes, taking a few pictures along the way. Tickets weren't available yet when the experience was first announced in the middle of February 2019, nor was an opening date, but both arrived on March 21. As for the date to circle on your Mickey Mouse calendar? This entry is separate from park admission, keep in mind, and "must be purchased online, in advance." What will mavens of the famous mouse, who recently marked his 90th anniversary, find inside? A collection of snap-a-pic places, including a black-and-white tribute to the Mickey Mouse short "Plane Crazy" — yep, you can "sit" in the little plane for your pose — as well as a mega Mickey balloon, standing at 8 feet tall. Other picture-perfect, step-inside displays fill the experience. Look also for "special artist collections" and other merchandise at the pop-up, which will have a bevy of items for sale, including ball caps and popcorn buckets. As for where you'll go after snapping all of your cute close-ups in front of the Mickey-cute backdrops and settings? Hang onto that ticket to "... purchase special treats such as Mickey Mouse-shaped fudge on a stick and metallic Mickey cake pops at Marceline Confectionary."